One of the questions I get a lot when someone finds out I’m a comedian is, “Have you ever gotten booed?” The answer is yes. Nothing will clear you sinuses like a good booing. And after it happens, you either quit or become fearless. But thankfully all of my booings have been in small comedy clubs and they happened before camera phones. The only thing worse than a private booing is a televised one. Which brings me to Amateur Night at the Apollo. Kids – come on man. you can’t boo kids. the only way you could maybe boo a kid is if you are a kid and even then it’s just not cool. God – you can’t boo God. Even though if anybody could take a booing it should be the all knowing. I mean, after all, he would know the boo was coming. He created “boo” but hey, just in case he has skin thinner than our current president, it’s probably not a good idea to boo the G-O-D.
Black Women doing anything – that’s right, you better not boo black women. What’s wrong with you? If black women have a television show by black women, for black women, about black women, you better not boo. Black girls rock, man. I would say you could boo God before you fix your mouth to boo a black woman. Everything black women do is great. The end. Tap dancing. Because seriously who really knows what the f*ck they are looking at anyway. It’s a wasted boo. Just sit through it and clap when everybody else does and keep it moving. 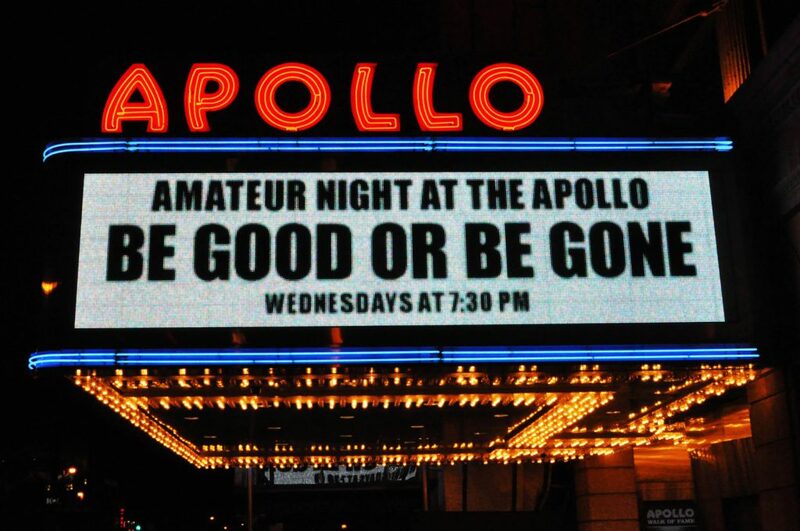 In conclusion, if they bring Showtime at the Apollo back and you find yourself a contestant on Amateur Night or you enter any black competition where they you could potentially get booed, and want to be a ‘boo proof act’ — I recommend you be a black woman who tap dances to gospel music while dedicating this performance to your kid.